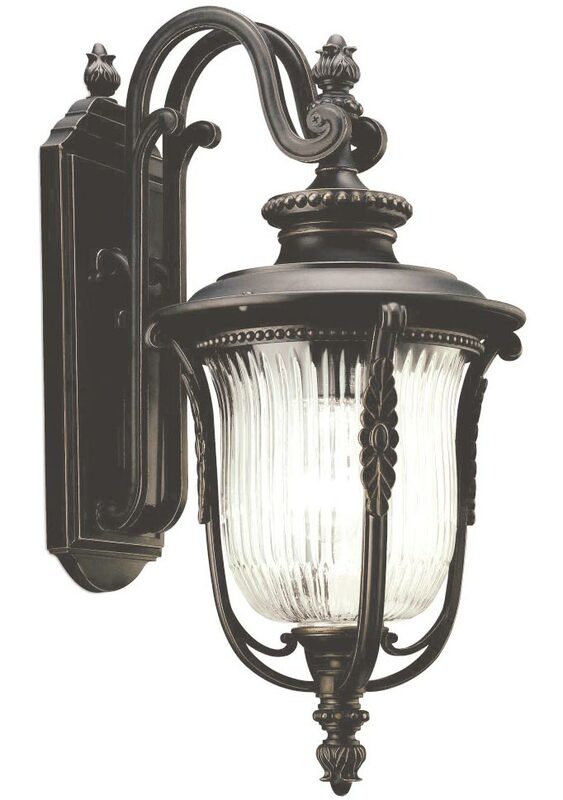 This Kichler Luverne 1 light medium outdoor wall lantern in oil rubbed bronze finish with ribbed glass shade is rated IP44 and features updated traditional period style. Boasting a cast rectangular wall mount with top bud finial, heavy over-arching scrolled arms and medium hanging lantern. Boasting a top bud finial and stepped roof, with concave outer bars decorated with leaf reveals, inner ribbed glass shade and lower finial. If you are searching for quality lighting in a traditional style, this medium outdoor wall light should be considered. Fully weatherproof and supplied with a manufacturer’s 3-year anti corrosion warranty, which relates to the corrosion of finishes on cast aluminium exterior lights like this one. Locations within 5 miles of the coast are excluded. This exterior light is supplied by Elstead Lighting and designed in the USA by Kichler who were founded in 1938. They design beautiful home lighting products featuring award-winning craftsmanship and unparalleled quality, such as the Luverne 1 light medium outdoor wall lantern in oil rubbed bronze finish with ribbed glass shade and rated IP44 you see here.